How can animals heal themselves AND their human companions? Many dis-eases are energy imbalances that have formed in the body before the physical symptoms manifest. Allecia Evans, the Animal Heeler, is able to communicate with animals on a soul level to address the root cause of why a symptom showed up, then energetically restore an animal’s health at a much deeper level. This in turn often heals their human as well! Find out the astonishing progress in Charly Kayle's own animals, thanks to distant energy healings from Allecia. Also learn why the wrong collar or harness could be the root cause of your dog's behavior or health issues, by jerking his body out of alignment, and worse. Allecia's humane harness system, Walk-In-Sync, solves the pulling problem. 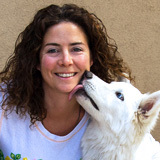 Allecia Evans, known as the "Animal Heeler", is a highly sought-after Energy Medicine Practitioner, Medical Intuitive, Animal Communicator, Holistic Dog Trainer, Qi Gong Practitioner and Soul Relationship Expert, with over 24 years of professional experience transforming animal behavior and health issues naturally. She is an award-winning TV & radio host, author, columnist, and is featured in the new book, “Soul Dog: A Journey Into the Spiritual Lives of Animals” by Elena Mannes, as well as in “Listening To the Horse” docuseries. Allecia is also the creator & inventor of the Walk-In-Sync Dog Walking System, a humane harness that keeps your dog's neck and body in alignment . Her passion is helping animals heal themselves and their humans, while spreading the Universal message of respect and reverence for all life. She can be found at animalheeler.com.